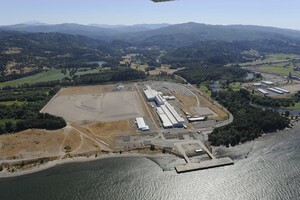 by Toni Tabora-Roberts OPB Sept. 27, 2013 2 p.m. | Updated: Feb. 18, 2015 8:18 a.m.
OPB’s daily radio program Think Out Loud had an interesting discussion this week about our daily encounters with nature and wildlife in our urban areas. Host David Miller spoke with Lyanda Lynn Haupt, a Seattle-based naturalist and author of the new book The Urban Bestiary. She encourages the idea of being ‘gracious co-inhabitants’ and explores the our mixed feelings about being with urban wildlife — like squirrels, coyotes, raccoons — in our everyday lives. It was a fun conversation, especially here in the Northwest where many are inclined to be friendly with our wildlife neighbors. As my toddler becomes more aware of the critters in our neighborhood, I find myself wondering the most healthy way for her to experience urban nature. Haupt: I asked Dr. Gehrt, what do you do when you see a coyote? He introduced this idea of a teachable moment. He said, every time a human encounters a coyote it’s a chance for the coyote to learn how to live in an urban environment where there will be tolerated. To increase chance of tolerance for something as wild and carnivorous as a coyote, they have to be as wary and as invisible as they possibly can. So, yes you want to chase them away, throw a stick, have them feel that … they can hang out, but not too close. Not really be seen. 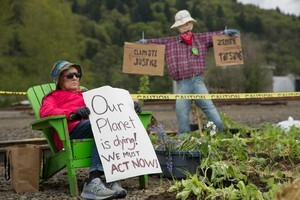 Miller: Which is counter intuitive, right? Because, if we’re talking to so many people who like the idea of welcoming animals … but you’re saying the best way to be a good neighbor, in this case, is to scare them away, push them away. 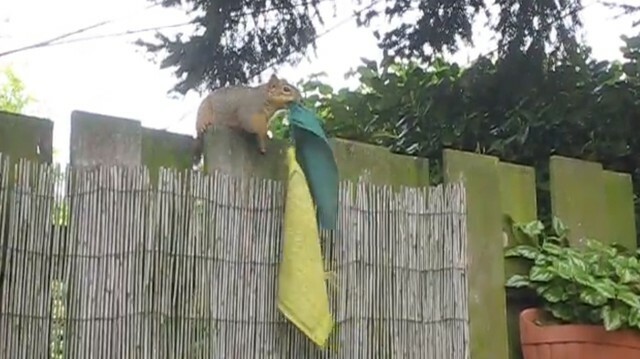 The most cute story I have is squirrels stealing my Tibetan prayer flags in the backyard… I actually posted on YouTube one of the squirrels coming down taking off the prayer flags, folding it up into a little package. And then putting in it’s mout and then running up the tree and putting it in the nest. I’m assuming it’s the nest, because a couple of years later I would find these ratty pieces of prayer flags that would falll down when they are finished. Check out the video below, which she posted on Think Out Loud’s blog.